When your children and your children’s children go through the family things some day, what will they find? Perhaps not our generation, but surely our children’s generation one thing that will not be passed down is the written word. Over the weekend, I hauled into the house from an old desk stored in the garage, a drawer filled with my life. Most of what was stowed away for years was from the early years in my radio career, but I also discovered high school memorabilia I thought was long gone – and frankly, I hadn’t even thought about it for decades. What I found that was most meaningful, were cards and letters from friends and family members. There’s a letter from my ‘mom-mom’ who died in 1995. The letter is dated December 31, 1981. She tucked into the note another note that she received from a niece of my late grandfather. She listened to me on the radio back then and was so glad to have that connection. My grandmother wrote how proud she was of me. A letter from my elementary school gym teacher dated November 10, 1981 wrote of how he and my other two favorite teachers had formed a ‘fan’ club and how they too, were listening to me on WMGK and were proud. I found letters from radio fans who talked about their lives and how connected they felt listening to me and the people I worked with. Most important were all the letters my brother wrote me when he was in the Air Force. This was in the early to mid 1980’s. These letters are particularly significant because my brother suffered a life-changing accident during his time in the Air Force and lost the use of his right arm. The letters he wrote before the accident describe his homesickness as well as the fun he was having seeing other places and meeting new people. He ultimately me his wife – and they lived happily ever after. But it was emotional for me to read the handwriting he had before the accident. He learned how to use his left hand and has done extremely well over the past 20+ years. When I work with clients and we are able to get media coverage, I always encourage them to write a ‘thank you’ to the reporter. If they want to type out an email, that’s OK, but looking at these files of handwritten cards I have – many of then ‘thank yous,’ I am so incredibly glad I’m a little bit of a pack rat. For me, there’s nothing like a personal card that someone had to choose or just find that blank sheet of paper to write a thoughtful few lines or more to offer their thanks. 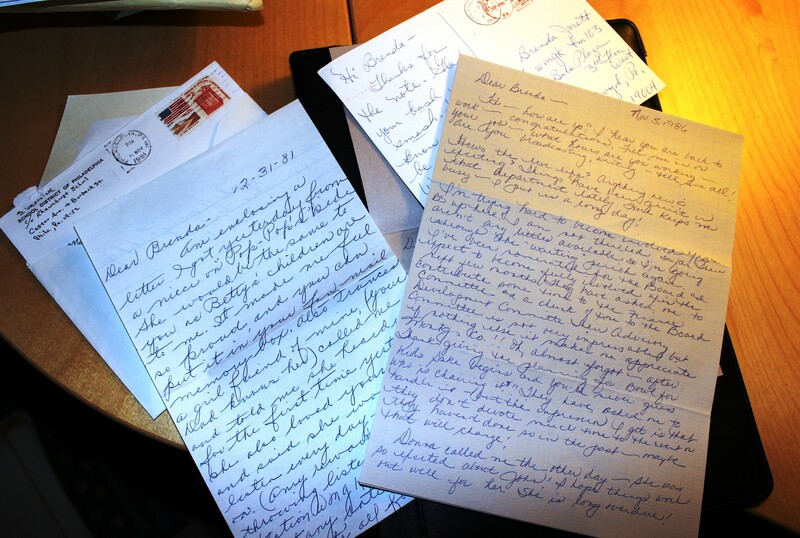 The letters from my grandmother and my brother and some friends are a part of me. They describe personal history that was going on back then and how they were interwoven in my life. My grandmother has been gone for years, but to read these letters I found makes me know that she was a part of me – and I of her. I can hear her laughing right now – probably after telling a dirty joke. Consider writing a card the next time you need to get in touch with someone. It’s worth the time and effort; and on the other end of that card, there is probably a friend, family member, colleague or someone you listen to, who will tuck that card in a file for safe keeping. This entry was posted in letter writing, parenting, remembering, remembering parents, Thank you, thank you cards, thank you notes, writing and tagged Family, Friends, letter-writing, memories, thank you cards. Bookmark the permalink. Absolutely love letter-writing. I’m glad you’re encouraging other reporters to do the same. Who did you write to last? I just wrote a note the other day to a teacher helping with a small project for the Earth Festival event I am involved with. Handwriting a note is such a special way to show appreciation. It’s so much more personal.